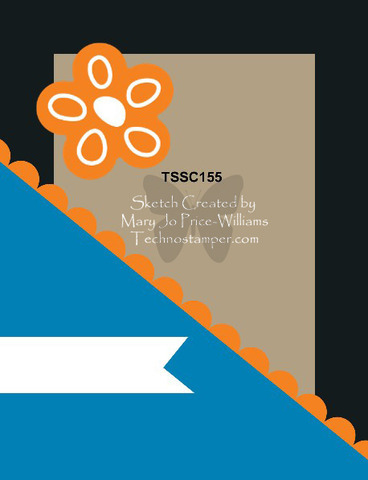 When I first saw this sketch from Mary Jo's Technostamper Monday Lunchtime Sketch Challenge, I did not know what to do with it. I knew I wanted to put a piece of patterned Designer Series Paper where the Crumb Cake Rectangle was on the card. I knew I wanted to put a stamped image in the spot of the flower with the scalloped circle behind it, but that was it. So, I started thinking. I knew I needed a baby card, so I might as well take the challenge with that in mind. At one point, I thought I needed almost every set SU sold. I didn't have quite that many, but I had a lot. Since then, I have realized I don't need every set and I don't purchase nearly as many as I used to. However, to my horror, when I looked through my catalog, I didn't have any baby set. None. Zero. Well, after another trip through the catalog, I saw that I didn't have a set just for babies, but I had sets that could work. I checked to see if the giraffe from "Fox and Friends" would fit in the scalloped circle. I also saw that "Family Phrases" had a really cute baby saying. And thus, my card was born. Using So Saffron and it's partner More Mustard with Blushing Bride and it's partner Regal Rose, a cute baby girl card came to life. My New Year's Challenge- find new ways to use the stamps you have. This isn't a huge stretch but it's always fun to use what you have to make cute projects. This is so sweet, great job coming up with an adorable baby card with no official baby sets, lol! Thanks so much for playing along again with my sketch challenge this week. You rock!